The 23-year-old Texan blamed for a deadly Austin bombing spree described himself as a psychopath and showed no remorse in a confession he taped before blowing himself up as police closed in to arrest him, a U.S. congressman said Saturday. Authorities had not previously disclosed details of the cellphone video in which Mark Conditt admitted being behind the string of bombings that began March 2, killing two people and wounding five others, beyond saying that it showed a troubled young man. “I think the best evidence we have at this point in time is the confession itself. ... He did refer to himself as a psychopath. 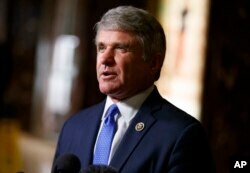 He did not show any remorse, in fact questioning himself for why he didn’t feel any remorse for what he did,” U.S. Rep. Michael McCaul told a news conference in Austin when asked about Conditt’s motive. FILE - Rep. Michael McCaul, R-Texas, talks with reporters, Nov. 29, 2016, in New York. Federal investigators have been hunting for clues about what drove Conditt, who was unemployed and lived with roommates in the Austin suburb of Pflugerville. They also want to know whether he had help building or planting the bombs. Three of the devices were left as parcels outside victims’ homes, while another was placed on a sidewalk and attached to a trip-wire mechanism. Two more were shipped as FedEx parcels, which helped investigators unmask the bomber’s identity. Conditt died after detonating an explosive device early Wednesday as police ran toward his vehicle in an Austin suburb.